Valentine cupcakes are a great way to treat a lot of people at one time to something a little bit special for Valentine's Day. You can take some cupcakes into the office for Valentine's Day, send cupcakes off to school with the kids, or even whip up a batch of patty cakes for your Sunday School class. 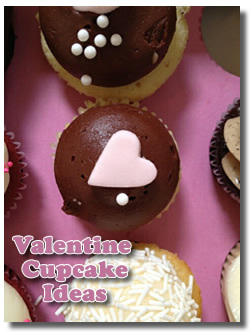 I suggested Valentine's Day cupcakes in the February 2013 newsletter, Charmingly Chocolate, with some cute decorating ideas. If you missed it, you can check out the cupcake ideas here. There are cupcake recipes galore online if you want to make your cake from scratch. Some are really marvelous with scrumptious fillings or unique flavors if you want to be creative. But, you can simply use a boxed cake mix if you are in a hurry or just can't be bothered (though it really is quite simple to make your own). Whatever you prefer is fine. The fun part is the decorations! You can be as simple or as elaborate as you like, but taking at least a few moments to make your cupcakes festive looking for Valentine's Day is enough to change the ordinary into the extra-ordinary. Red, white, and pink sprinkles or "jimmies" are one of the easiest places to start when dressing up cupcakes for Valentine's Day. Conversation heart candies are another very quick and simple option that only takes seconds to add. Of course, you can get really elaborate with decorative fondant, drizzled or molded chocolates, or various colored and types of icing or frosting. As I suggested in the newsletter, take a few minutes and browse through the many images online of Valentine cupcakes and get your imagination and creative juices flowing. And don't forget to show off what you make by adding them here at Chocolate Candy Mall. We always love to see your work.